Paula Fletcher, 42, of Queen Elizabeth Way, Ilkeston. Indicated a guilty plea to failing to notify the Department for Work and Pensions of a change of circumstances affecting her entitlement to a carer’s allowance in that she had started employment. Must pay a £85 victim surcharge and £85 costs. Community order to last until April 6. 2020, with 80 hours of unpaid work. Mark Hanson, 42, of no fixed abode. Indicated a guilty plea to causing or inciting a girl aged 13 to engage in sexual activity at Heanor. Must pay an £85 victim surcharge and £85 costs. Community order to last until April 7, 2021, with a Rehabilitation Activity Requirement and 150 hours of unpaid work. Made subject to a Sexual Offences Prevention Order. Simon Paul Courtnage, 46, of Market Street, Ilkeston. Pleaded guilty to stealing numerous items valued at £76.59 belonging to Tesco, on Rutland Street, Ilkeston. Pleaded guilty to failing to surrender at court having been released on bail in criminal proceedings. Must pay a £115 victim surcharge. Pleaded guilty to stealing three bottles of Jack Daniels valued at £105 belonging to Tesco, on Waverley Street, Long Eaton. Pleaded guilty to two counts of stealing meat belonging to Sainsbury’s, on Tamworth Road, Long Eaton. Committed to prison for seven days. Brian John Harris, 41, of Aldreds Lane, Heanor. Indicated a guilty plea to contacting a certain person at Heanor which he was prohibited from doing by a restraining order. Must pay a £115 victim surcharge. Pleaded guilty to assault by beating at Heanor. Committed to prison for eight weeks. Christopher David Boulton, 31, of Nottingham Road, Ilkeston. Found guilty of being seen begging which he was prohibited from doing by a Criminal Behaviour Order. Must pay an £85 victim surcharge and £300 costs. Application to revoke a community order imposed in February and re-sentence on the grounds that he has committed another offence. No adjudication. Community order revoked. 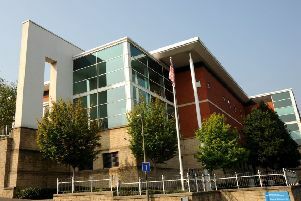 Convicted of entering Derby City Centre which he was prohibited from doing by a Criminal Behaviour Order. Community order to last until August 2, 2019, with a four-month curfew with electronic monitoring. Troy Steven Gray, 40, of Regent Court, Ironville. Pleaded guilty to using threatening behaviour. Must pay an £85 victim surcharge and £300 costs. Community order to last until May 22, 2019, with a seven week curfew with electronic monitoring. Martin Paul Simpson, 44, of Lime Street, Ilkeston. Admitted breaching a domestic violence protection order by contacting the victim by text on April 1 and 2 at Ilkeston. Fined £150. Also to be detained in the court house and detention deemed served by time already spent in custody or pay £150. Tyrone Knighton, 22, of Beauvale Drive, Ilkeston. Indicated a guilty plea to committing fraud at Heanor Road, Ilkeston, by false representation by withdrawing £250 on two occasions using a debit card belonging to someone else. Must pay £500 compensation. Indicated a guilty plea to stealing 16 packs of razor blades valued at £298 belonging to Morrisons at Ilkeston. Must pay £85 costs. Committed to prison for eight weeks suspended for 12 months with a Rehabilitation Activity Requirement. Connor Barrowcliffe, 22, of John Street, Ilkeston. Pleaded guilty to being drunk and disorderly in a public place on Beresford Road, at Long Eaton. Fined £50. Pleaded guilty to stealing two creates of alcohol valued at £18.50 belonging to the Co-op at Long Eaton. Must pay £15 compensation and an £85 victim surcharge. Community order to last until May 27, 2019, with an eight week curfew with electronic monitoring. Stephen James Haugh, 40, of Elnor Street, Langley Mill, Heanor. Pleaded guilty to using threatening behaviour at Heanor. Must pay a £115 victim surcharge. Pleaded guilty to damaging a wall at Heanor. Restraining order to last until April 1, 2021. Committed to prison for eight weeks. Admitted committing an offence while subject to a six-month conditional discharge order imposed for possessing drugs. No action taken on the breach. Michael Joseph Hehir, 53, of Victory Avenue, Ripley. Found guilty of being in charge of a vehicle on Peasehill Road, Ripley, after consuming so much alcohol that he had exceeded the prescribed limit. Fined £500 and must pay a £50 victim surcharge and £620 costs. Disqualified from driving for 12 months. Kimberley Jones, 31, of Heage Road, Ripley. Pleaded guilty to exceeding the alcohol drink-drive limit on Derby Road, at Marehay. Fined £400 and must pay a £40 victim surcharge and £85 costs. Disqualified from holding or obtaining a driving licence for 12 months. Anthony John Gill, 44, of Cleveland Road, Stonebroom, Alfreton. Pleaded guilty to driving a vehicle without due care and attention on Bevan Street, at Shirland. Fined £75 and must pay a £30 victim surcharge and £85 costs. Driving record endorsed with four points. Stivan Ivanov, 25, of South Street, South Normanton, Alfreton. Pleaded guilty to driving without due care and attention on the A38, at Alfreton. Fined £131 and must pay a £30 victim surcharge and £85 costs. Driving record endorsed with four points. Shaun Marshall, 45, of John Street, Heanor. Pleaded guilty to driving a vehicle on Station Road, at Langley Mill, when the proportion of controlled drug cannabis in his blood exceeded the specified limit. Fined £300 and must pay a £30 victim surcharge and £85 costs. Disqualified from driving for 12 months. Chloe McAra, 20, of Potters Way, Ilkeston. Pleaded guilty to exceeding the alcohol drink-drive limit on Chichester Close, Ilkeston. Fined £300 and must pay a £30 victim surcharge and £85 costs. Disqualified from driving for 12 months. Matthew Jasper, 46, of Town End Road, Draycott. Pleaded guilty to exceeding the alcohol drink-drive limit on Bostocks Lane, Long Eaton. Fined £553 and must pay a £55 victim surcharge and £85 costs. Disqualified from driving for 20 months. Luke John Meads, 37, of no fixed abode. Pleaded guilty to stealing fabric softeners belonging to Wilkinson’s, on Bath Street, Ilkeston. Must pay £42 compensation and a £115 victim surcharge. Pleaded guilty to stealing five Ted Baker gift sets valued at £110.50 belonging to Boots, on Bath Street, Ilkeston. Must pay £110.50 compensation. Committed to prison for four weeks. Darren Paul Clarke, 34, of Elvaston Street, Draycott. Pleaded guilty to stealing various groceries valued at £83.86 belonging to Farmfoods, of cross Street Retail Park, Cross Street, Long Eaton. Must pay £83.86 compensation. Pleaded guilty to stealing various groceries valued at £33.99 belonging to Farmfoods, at Long Eaton. Must pay £33.99 compensation. Committed to prison for six weeks suspended for six months. Derek William Winfield, 28, of Little Hallam Lane, Ilkeston. Pleaded guilty to assault occasioning actual bodily harm at Regent Court, Ironville. Must pay £100 compensation, an £85 victim surcharge and £300 costs. Community order to last until June 27, 2019, with a 12 week curfew with electronic monitoring. Scott Anthony Redfern, 36, of St Norbert Drive, Kirk Hallam, Ilkeston. Pleaded guilty to five counts of assault by beating at Ilkeston. Must pay £400 compensation. Committed to custody for 16 weeks suspended for 12 months with a 12 week curfew with electronic monitoring and a Building Better Relationships programme and a Rehabilitation Activity Requirement. Restraining order to last until April 2, 2022. Damon Mark Cadle, 31, of Derby Road, Long Eaton. Pleaded guilty to assault by beating at Wilmot Street, Sawley. Must pay a £115 victim surcharge. Committed to prison for 14 weeks. Restraining order to last until April 1, 2022.